Army, Marine Corps, and Air Force one-star insignia of the rank of brigadier general. Style and method of wear may vary between the services. U.S. Army, U.S. Marine Corps, and U.S. Air Force rank insignia for brigadier general. Style and method of wear may vary between the services. Rank flag of a brigadier general in the United States Army. The flag of a brigadier general of the Army Medical Department has a maroon background; the flag of a chaplain (brigadier general) has a black background. Flag of a United States Marine Corps brigadier general. Flag of a United States Air Force brigadier general. U.S. Army insignia of the rank of brigadier general. Style and method of wear may vary between the services. U.S. Army brigadier general uniform epaulet from September 1959 to October 2015. U.S. Marine Corps insignia of the rank of brigadier general. Style and method of wear may vary between the services. U.S. Air Force insignia of the rank of brigadier general. Style and method of wear may vary between the services. In the United States Armed Forces, brigadier general (BG, BGen, or Brig Gen) is a one-star general officer with the pay grade of O-7 in the U.S. Army, U.S. Marine Corps, and U.S. Air Force. Brigadier general ranks above a colonel and below major general. The rank of brigadier general is equivalent to the rank of rear admiral (lower half) in the other uniformed services (the U.S. Navy and U.S. Coast Guard, as both Armed Forces and Uniformed Services; and the Public Health Service and National Oceanographic and Atmospheric Administration, as Uniformed Services). The NATO equivalent is OF-6. The rank of brigadier general has existed in the U.S. military since the inception of the Continental Army in June 1775. To prevent mistakes in recognizing officers, a general order was issued on July 14, 1775, establishing that brigadier generals would wear a ribband, worn across the breast, between coat and waistcoat, pink in color. Later, on June 18, 1780, it was prescribed that brigadier generals would instead wear a single silver star on each epaulette. At first, brigadier generals were infantry officers who commanded a brigade; however, over the course of the 19th and 20th centuries, the responsibilities of the rank expanded significantly. During the period from March 16, 1802, to January 11, 1812, the rank of major general was abolished and brigadier general became the highest rank in the U.S. Army. Foreseeing the need for an expanded general staff in case of war, which seemed imminent, Congress restored the rank of major general in January 1812. The first brigadier general in the U.S. Marine Corps was Commandant Archibald Henderson, brevetted to the rank of brigadier general in the 1830s for his service in the Second Seminole War. The first non-brevet brigadier general in the Marines was Commandant Jacob Zeilin who was promoted to the rank in 1874, but when he retired in 1876, colonel once again became the highest rank in the Marines until March 1899 when Commandant Charles Heywood was promoted. Ever since then, the office of Commandant has been held by a general officer, with the permanent rank of the commandant raised to major general in 1908, and then to lieutenant general and subsequently to general during World War II, which rank it has held ever since. 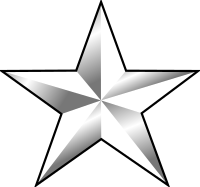 The insignia for a brigadier general is one silver star worn on the shoulder or collar, and has not changed since the creation of the rank two centuries ago. Since the Mexican–American War, however, the lower rank of colonel has been the normal rank appointed to command a brigade that is organic to a division (e.g., the 1st Brigade of the 94th Infantry Division, vice the 187th Infantry Brigade). While separate brigades (e.g. the 187th, commanded by then-BG William Westmoreland in Korea) were traditionally commanded by brigadier generals, this practice has ceased in recent history. Today, an Army or Marine Corps "BG" or "BGen," respectively, typically serves as deputy commander to the commanding general of a division or division-sized units and assists in overseeing the planning and coordination of a mission. A Marine Expeditionary Brigade (MEB), as the medium capability (and sized) scalable Marine Air Ground Task Force (MAGTF) with up to 20,000 Marines, is normally commanded by a Marine BGen. An Air Force brigadier general typically commands a large wing or serves as the deputy commander for a NAF. Additionally, one-star officers of all services may serve as high-level staff officers in large military organizations. The U.S. law explicitly limits the total number of general officers who may be on active duty. The total of active duty general officers is capped at 231 for the Army, 62 for the Marine Corps, and 198 for the Air Force. The President or Secretary of Defense may increase the number of general slots in one branch, so long as they subtract an equal number from another. Some of these slots are reserved by statute. For promotion to the permanent grade of brigadier general, eligible officers are screened by a promotion board consisting of general officers from their branch of service. This promotion board then generates a list of officers it recommends for promotion to general rank. This list is then sent to the service secretary and the joint chiefs for review before it can be sent to the President, through the defense secretary, for consideration. The President nominates officers to be promoted from this list with the advice of the Secretary of Defense, the service secretary, and if applicable, the service's chief of staff or commandant. The President may nominate any eligible officer who is not on the recommended list if it serves in the interest of the nation, but this is uncommon. The Senate must then confirm the nominee by a majority vote before the officer can be promoted. Once the nominee is confirmed, they are promoted to that rank once they assume or hold an office that requires or allows an officer of that rank. For positions of office reserved by statute, the President nominates an officer for appointment to fill that position. For all three uniformed services, because the grade of brigadier general is a permanent rank, the nominee may still be screened by an in-service promotion board. The rank does not expire when the officer vacates a one-star position. Tour length varies depending on the position, by statute, or when the officer receives a new assignment. The average tour length per one-star billet is two to four years. Other than voluntary retirement, statute sets a number of mandates for retirement. All brigadier generals must retire after five years in grade or 30 years of service, whichever is later, unless selected or appointed for promotion, or reappointed to grade to serve longer. Otherwise all general and flag officers must retire the month after their 64th birthday. However, the Secretary of Defense can defer a general or flag officer's retirement until the officer's 66th birthday and the President can defer it until the officer's 68th birthday. Because there are a finite number of General officer positions, one officer must retire before another can be promoted. As a result, General and flag officers typically retire well in advance of the statutory age and service limits, so as not to impede the upward career mobility of their juniors. ^ a b "Officer Insignia of Rank – Origin". The Institute of Heraldry. Office of the Administrative Assistant to the Secretary of the Army. Archived from the original on 2012-07-15. Retrieved 20 May 2013. ^ "Types of MAGTFs". U.S. Marine Corps. 2013-12-11. Retrieved 2018-03-16. ^ Law.cornell.edu, 10 U.S.C. 624. Promotions: how made. ^ Caselaw.lp.findlaw.com, 10 U.S.C. 635. Retirement for years of service: regular brigadier generals and rear admirals (lower half). ^ thomas.loc.gov Archived 2015-11-01 at the Wayback Machine, 10 U.S.C. 1253. Age 64: regular commissioned officers in general and flag officer grades; exception. ^ Defenselink.mil, DoD News Briefing on Thursday, June 6, 1996. Retirement of Admiral Leighton W. Smith Jr.